Many drug-resistant infections are the result of bacterial biofilms, structured aggregates of bacteria that live on surfaces and that are extremely resistant to environmental stresses. These biofilms impact human health in many ways — cystic fibrosis, for example, is a disease in which patients die from airway bacterial biofilm infections that are invulnerable to even the most potent antibiotics. Now, UCLA researchers and their colleagues have found that during the initial stages of biofilm formation, bacteria can actually stand upright and "walk" as part of their adaptation to a surface. 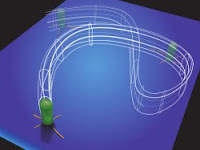 "Bacteria exist in two physiological states: the free-swimming, single-celled planktonic state and the surface-mounted biofilm state, a dense, structured, community of cells governed by their own sociology," said Gerard Wong, a professor of bioengineering at the UCLA Henry Samueli School of Engineering and Applied Science and at the California NanoSystems Institute at UCLA. "Bacteria in biofilms are phenotypically different from free-swimming bacteria even though they are genomically identical. As part of their adaptation to a surface and to the existence of a community, different genes are turned up and down for bacteria in biofilms, leading to drastically different behavior," he said. In the study, which appears in the current issue of the journal Science, Wong and his research group describe the new surface adaptation — the "walking" motility mechanism, which was observed in Pseudomonas aeruginosa, a biofilm-forming pathogen partly responsible for the lethal infections in cystic fibrosis. What enables this upright walking are appendages called type IV pili, which function as the analog of legs. What's more, walking allows P. aeruginosa to move with trajectories optimized for surface exploration, so that they can forage more effectively. The upright orientation is also the first step in surface detachment for bacteria. "We've shown that vertical orientation plays a critical role in key life-cycle events: vertically oriented bacteria can more readily detach from surfaces, allowing them to spread and disperse effectively," said Jacinta Conrad, a former postdoctoral researcher with Wong's group and an assistant professor of chemical and biomolecular engineering at the University of Houston. "Our unique contribution is to directly relate single-cell behavior to specific events in the bacterial life cycle and thereby show how single-cell motility influences biofilm morphology." The research team was able to develop a series of search engines and computer programs that use particle-tracking algorithms to quantitatively analyze time-lapse microscopy movies of bacterial motion on surfaces. "Previously, graduate students had to look at cells manually and then laboriously track them from one frame to the next," Wong said. "Our computational approach allows us to increase the volume of data analyzed 100,000-fold and to perform the necessary analysis in a few hours rather than a few months. "Moreover, we make sense of this mountain of information using search engine–based approaches. This represents a big advance in the way microscopes are used." The work was conducted in collaboration with a research group at the University of Notre Dame led by Joshua Shrout, an assistant professor in the department of civil engineering and geological sciences and at the Eck Institute for Global Health. "One of the most exciting factors of this work for me is the potential for widespread impact," Conrad said. "Biofilm formation is ubiquitous in human health and also in a variety of industrial settings. Biofouling due to biofilm formation increases the hydrodynamic drag on ships, leading to increased fuel consumption, and also contributes to increased costs in water treatment, oil recovery and food processing. Controlling biofilm formation will therefore allow us to reduce biofouling-related problems across a wide range of industries."